The 4th Thai-Lao Friendship Bridge over the Mekong River is to open tomorrow, 12 December, significantly easing travel between northern Thailand and northern Laos. The new bridge spans the river between Chiang Khong in Chiang Rai province, Thailand, and Houay Xai in Bokeo province, Laos. For anyone joining a river cruise down the Mekong River to Luang Prabang, such as the Luang Say or the Nagi of Mekong, this should make joining your boat from Thailand significantly quicker and easier. Hooray! 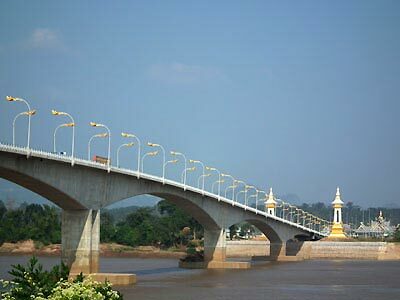 The three other Mekong Friendship Bridges are: Vientiane-Nong Khai, Savannakhet-Mukdahan, and Khammouan-Nakhon Phanom. The construction of the fifth bridge between Bolikhamxai province of Laos and Bung Kan province in Thailand is also in the pipeline, while there is a plan to build a sixth bridge between Saravane province in Laos and Ubon Ratchathani province in Thailand.